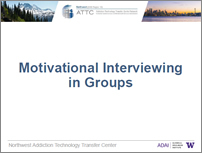 Motivational Interviewing is an evidence-based counseling approach that helps people with mental health and substance use disorders, as well as other chronic conditions (diabetes, asthma, heart disease, e.g. ), make positive behavioral changes to support better health. The developers of MI define it as “a collaborative conversation style for strengthening a person’s own motivation and commitment to change” (Miller & Rollnick, 2012). This guiding style of conversation is used to help the person identify their own reasons and solutions for change. empowering clients’ sense of autonomy over their own change. MI is well suited for a variety of health settings because it can be applied in briefer patient encounters (Rollnick, Miller, & Butler, 2007), and also works well in combination with other interventions (Arkowitz, Westra, Miller, & Rollnick, 2017). It can be used in group settings (Wagner & Ingersoll, 2012), and its skills are valuable in any situation where resistance to change is encountered (for example, managers and supervisors may find MI skills valuable to use with staff facing change in the workplace). Miller WR, Rollnick S. (2012). Motivational Interviewing, Third Edition: Helping People Change. New York, NY: Guilford Press. Rollnick S, Miller WR, Butler CC. (2007). Motivational Interviewing in Health Care: Helping Patients Change Behavior. New York, NY: Guilford Press. Arkowitz H, Miller WR, Rollnick S. (2017). Motivational Interviewing in the Treatment of Psychological Problems. Second Edition. New York, NY: Guilford Press. Wagner CC, Ingersoll KS. (2012). Motivational Interviewing in Groups. New York, NY: Guilford Press. 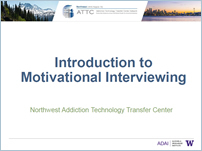 Looking for Motivational Interviewing Training or Technical Assistance? Learn the foundational concepts and skills of MI, including the underlying spirit of MI, its four processes, and core skills. Develop new skills through the use of role play, individual practice, and interactive group exercises. The principles and strategies of MI provide a set of communication and relationship strategies designed to address the common issue of ambivalence toward change, something managers and clinical supervisors may encounter among staff when introducing new practices. This workshop explores the application of MI strategies to working effectively with employees to facilitate internal motivation for change and empower staff using a strength-based approach to leadership. Intensive technical assistance packages and services are available to promote the successful adoption and implementation of MI. These services are custom-designed and may include follow-up training and booster sessions, individual coaching sessions, and leadership training on MI implementation. To request training on MI, contact us at northwest@attcnetwork.org.